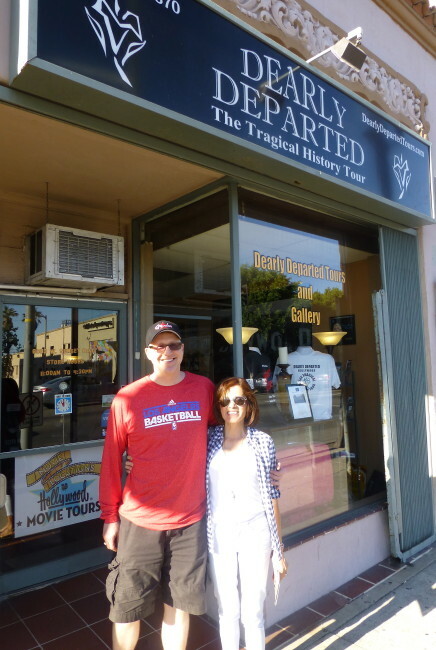 Feeling a little ghoulish about the entire idea, Tracy and I parked our car and walked over to the Hollywood headquarters of Dearly Departed Tours on a hot summer afternoon. This is something we had really looked forward to ever since our friends told us about this unique opportunity. Soon we would meet friends Kelly and Jeffrey at the Dearly Departed Tours office, and then head out on a three-hour tour (sans Gilligan) to see the locations where some notable crimes and deaths had occurred in the Hollywood area over the years. 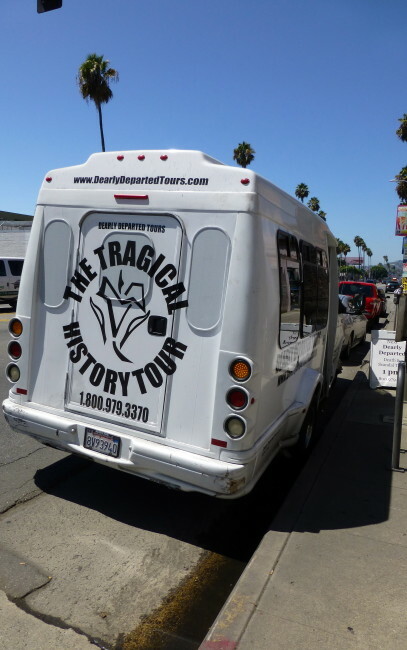 The name of the tour we were about to take was (and still is) called (very cleverly)…The Tragical History Tour. Walking toward the headquarters of death, the van we were to hop on shortly stated quite specifically that we had reached our appointed destination with doom. 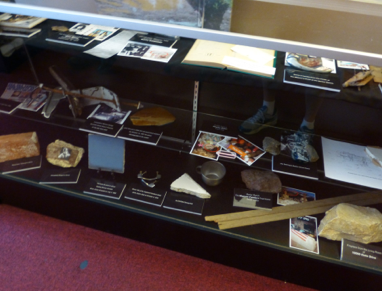 Tracy and I had arrived early, so after signing in we got to check out an array of unusual artifacts that Michaels has collected over the years. 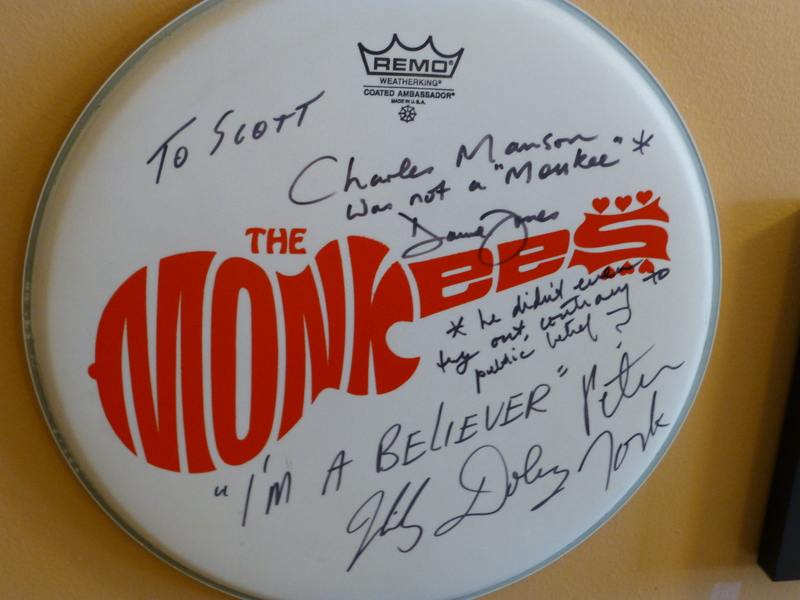 The first thing we saw was a signed frisbee autographed by all the members of the pop group, The Monkees. As you can see above, they made a point to make sure that everyone knows that Charles Manson was never a member of the group. I guess he must have caught The Last Train To Clarksville. 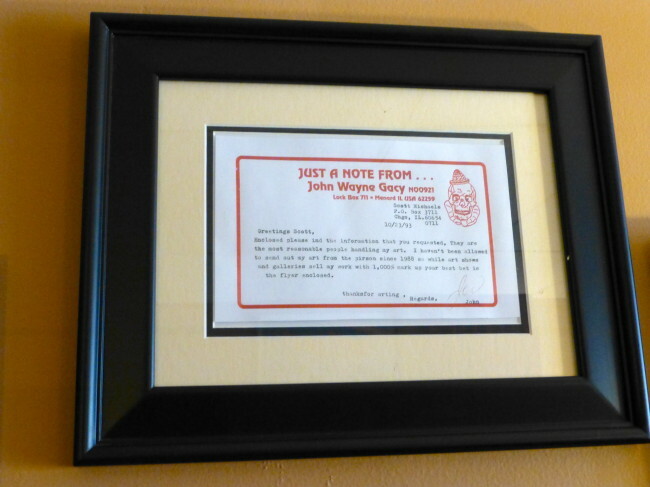 There’s not a lot of places (I’ll hazard a guess this is the only place) where you can look at a note written by serial killer clown John Wayne Gacy. It even had a clown logo. 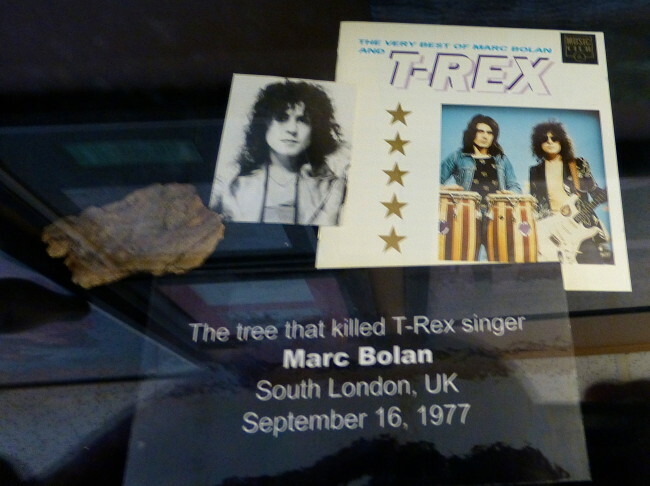 In the 1970s, the lead singer of T-Rex (Bang-A-Gong), Marc Bolan, was killed when his car slammed into a tree. Yep, Scott went out on a limb and has a piece of that tree. Scott has even more pieces sure to “entertain” those of us with a rather morbid curiosity. In a display case, we also saw a piece of the airplane that John Denver perished in when he slammed his plane into the Pacific Ocean. 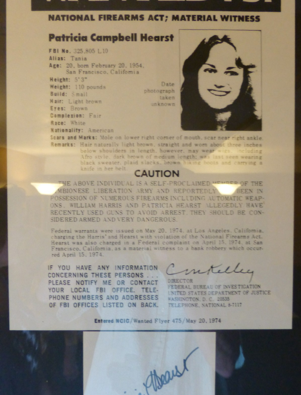 We also got to see a Patty Hearst “Wanted” poster. 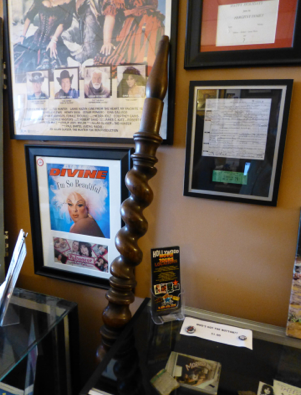 Other memorabilia includes the bedpost of Rock Hudson’s deathbed, and a piece of luggage (a lovely pink suitcase) Jayne Mansfield had in the car when she was decapitated. Now it was time to head out (sorry Jayne) for our appointment with the Grim Reaper. Some other friends, Craig and his wife Dolores, had now joined us, so we and a few other equally morbid curiosity seekers hopped into the van, and for the next three hours or so Brian drove us around various locales in town where some famed people met their demise…many of them untimely (of course, death is usually untimely). 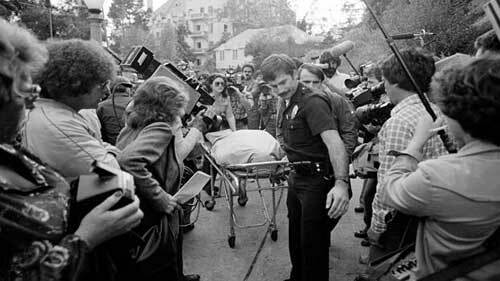 One of the first detours had nothing to do with death (well, we think not), but Brian liked to drive near the Scientology Celebrity Centre International ostensibly to freak out the guards, I think. 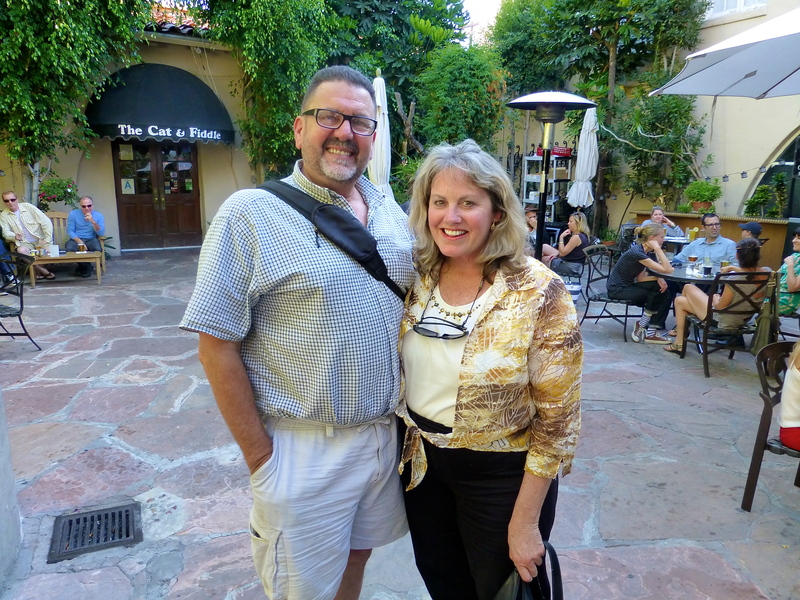 Brian said they were watching us from various locales to see if we were up to something nefarious. Tom Cruise was, thankfully, nowhere to be found. 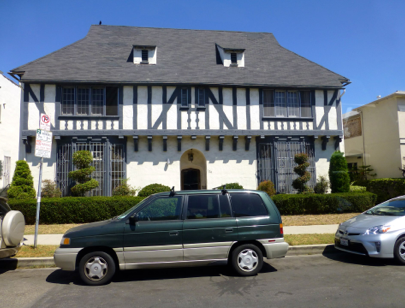 In a short time, Brian stopped the van across from a cool looking house. This was the former home of a guy named George Hodel. George had a son named Steve, who was a former LAPD officer. 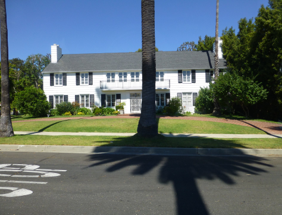 Young Hodel accused his dad of murdering Elizabeth Short in this house and even wrote a book about it. 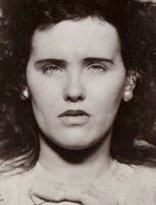 This was the famous Black Dahlia case. 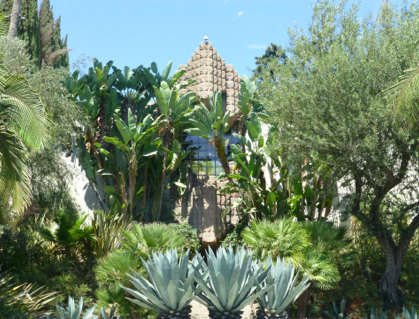 This home was known as the “Sowden House,” and was built in 1926 by Frank Lloyd Wright’s son for photographer John Sowden as an homage to the Mayan pyramids. 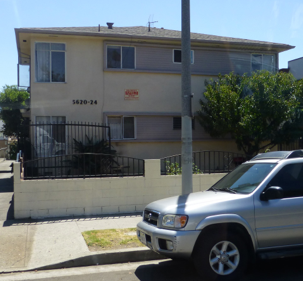 Short’s mutilated body was found in Leimert Park. Her body had been severed at the waist and completely drained of blood. However, that had nothing to do with Bela Lugosi. 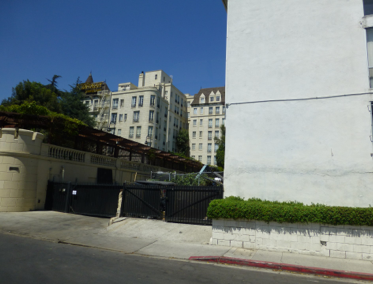 Speaking of the Dracula actor, our next stop took a look at the apartment where horror star Lugosi died, and we got to hear a song called Bela Lugosi. Yes, kitschy indeed. 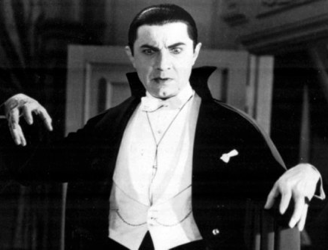 It’s said that Lugosi was buried in his Dracula cape. That must have driven his relatives batty. A short time afterward, Bardo returned to her house on North Sweetzer. 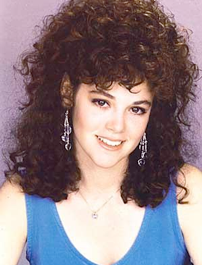 When Schaeffer opened the door, this time he fired two gunshots, killing the young star who starred in the television show My Sister Sam. He is serving life in prison, and stalker laws were enacted after this tragic murder. 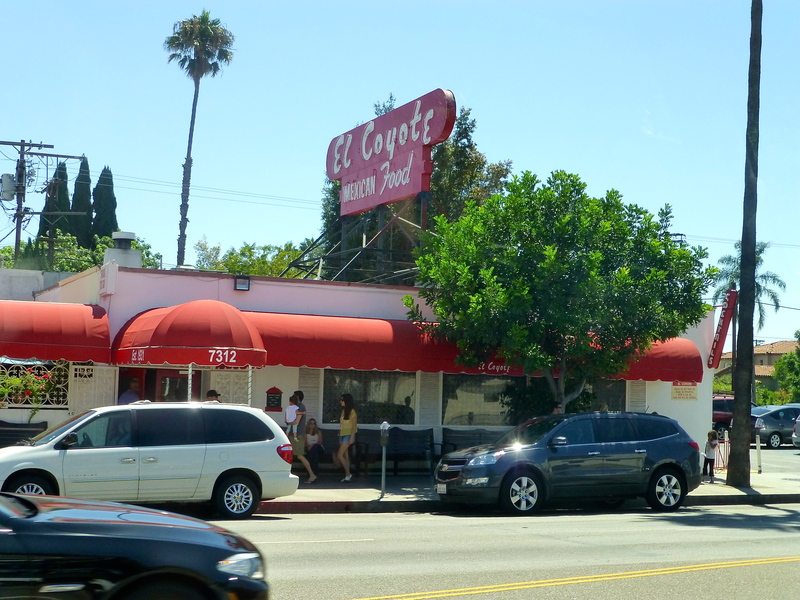 We passed by the famed El Coyote Mexican restaurant on Melrose Avenue, which hosted its own version of The Last Supper. 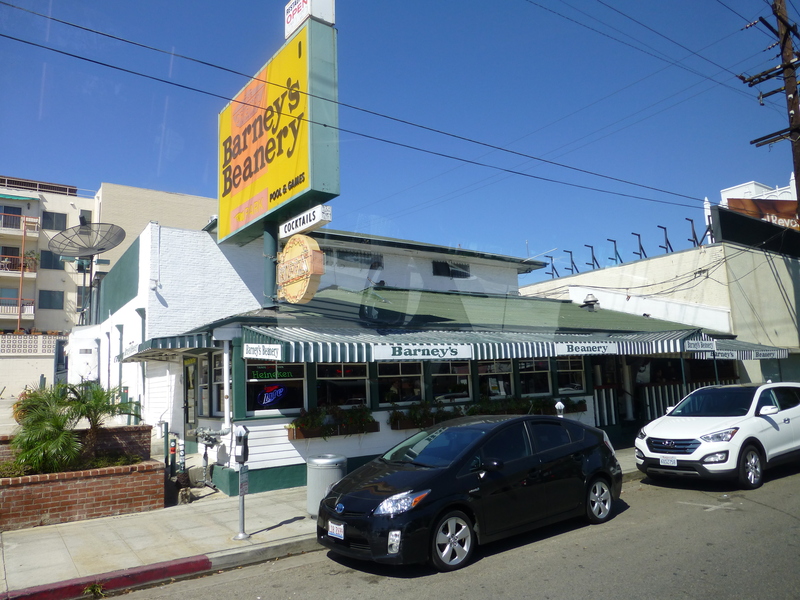 It was here that actress Sharon Tate along with friends Jay Sebring, Abigail Folger and Wojciech Frykowski ate their final meal. Later that night they were murdered by the Manson Family. It’s actually amazing that El Coyote’s food didn’t kill them first. Barney’s Beanery on Santa Monica Blvd. 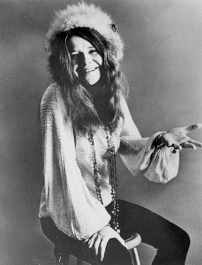 in West Hollywood is where Janis Joplin had a few drinks the night before her death. 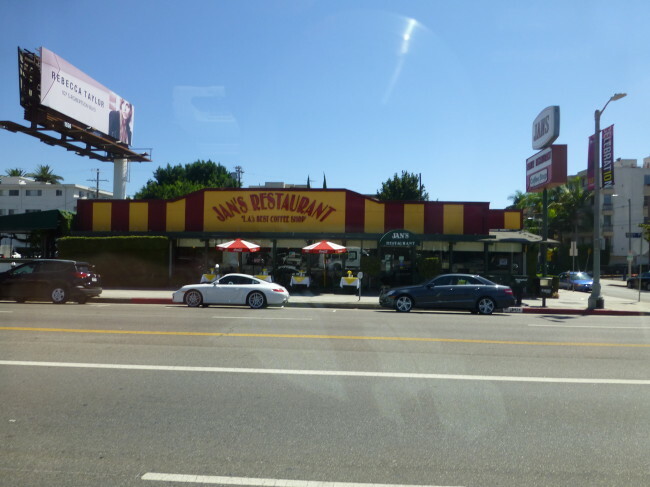 It has also been reported that many who work there think the restaurant is haunted. Truthfully, it’s haunted only by its menu. Joplin actually died at the nearby Landmark Motor Motel. The official cause of death was an overdose of heroin, possibly compounded by alcohol. Barney’s cocktails must pack quite a punch. 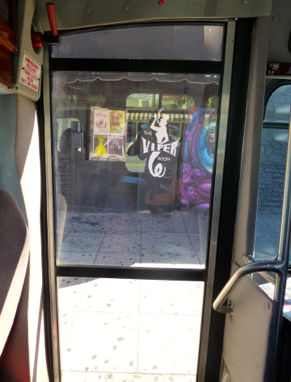 We made a quick stop at The Viper Room on Sunset Blvd., the place where actor River Phoenix collapsed and died of drug-induced heart failure on the sidewalk outside the West Hollywood nightclub. 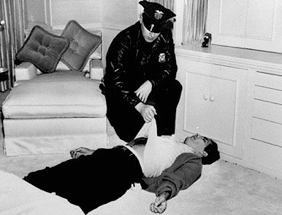 As we parked in front of the club, Brian played the 911 tape of his brother Joaquin’s frantic phone call to 911. 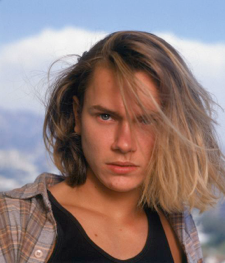 It was, of course, too late to save River. 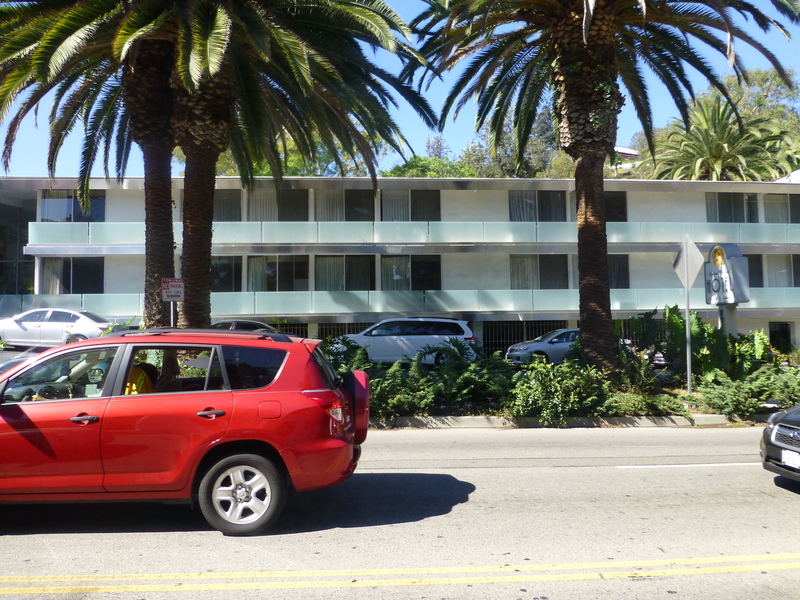 While we toured Beverly Hills, we stopped in front of the home where actress Lana Turner’s daughter stabbed Turner’s lover, gangster Johnny Stompanato, in 1958. In true Hollywood fashion, the daughter pleaded self defense and beat the rap. Phil Spector, eat your heart out! We stopped by other beautiful homes that included the house where The Menendez Brothers offed their parents. We also saw a few of the stars homes, too, including the estate of Michael Jackson (which you really can’t see from the van). I’ve lived in towns smaller than Jackson’s property. Finally, Brian drove us past John Belushi’s bungalow (Bungalow 3) at the Chateau Marmont where a combination of cocaine and heroin killed the Saturday Night Live star in 1982. Sadly, the tour was now complete, and we all enjoyed this rather fascinating glimpse into Hollywood’s notorious crimes. It’s probably not for everyone, but if you’re not too afraid of death and witnessing a few corpses (Brian had a folder for us to follow along as the tour progressed) then I think you will enjoy this unusual tour. They have a couple of other options, too. I think we’ll go on the Dearly Departed Helter Skelter Tour of the Manson Murder Locations. 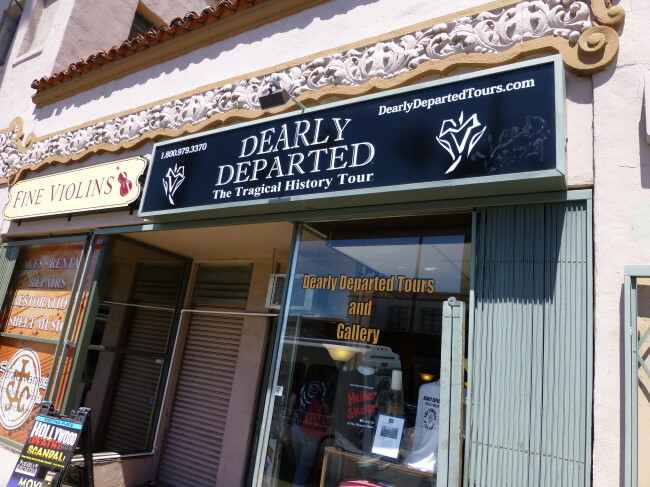 Some might say, “I wouldn’t be caught dead doing these tours,” but they will be missing out on an interesting day. I highly recommend it!